Leading Manufacturer of hdmi splitter from Mumbai. Milestone’s “HDMI Splitter” is a unit whereby you can send your HDMI output of set-top boxes, DVD Players, D-VHS Players, PC’s and other HDTV devices to as many as 2/4/8 HDMI inputs of monitor /LCD/Plasma/Projectors with the same strength & quality and an ability to daisy chain or cascade for multiple larger number of displays.They work on simple plug and play functionality. They connect to both HDMI and DVI-D single link Displays. 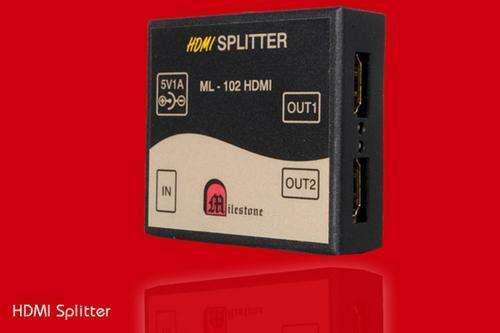 Looking for “Audio and Video Splitter”?